"Trump And Kim" Booted From Olympic Stadium - Joe.My.God. President Donald Trump and North Korean leader Kim Jong Un were thrown out of the opening ceremony of the Winter Olympics on Friday night after causing a scene at Pyeongchang Olympic Stadium. 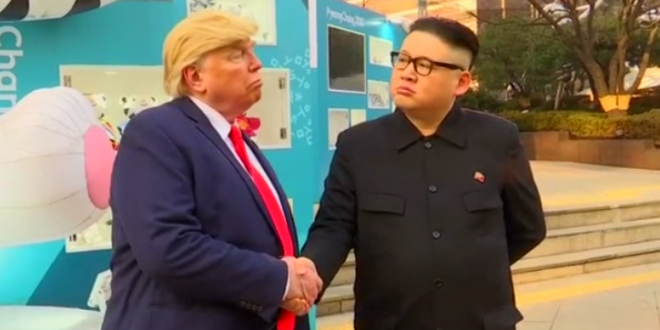 OK, full disclosure, it was a pair of hysterically accurate impersonators who had heads turning everywhere they went, with the Trump lookalike clad in a red “USA” cap and the Kim clone with the tyrannical leader’s trademark look. The unlikely duo — the real-life versions of whom are at odds politically — wandered through the lower section of the crowd near the media seating section shortly after the United States team finished its walk in the Parade of Nations. According to National Public Radio’s Melissa Block, the impersonators were escorted from the stadium by security staff just behind the media section. Fake Kim appears to have an Australian accent.